If you are looking for a resort in Ao Nang, Krabi, that's extremely close to Ao Nang Beach and serves the most incredible breakfast. Then look no further. 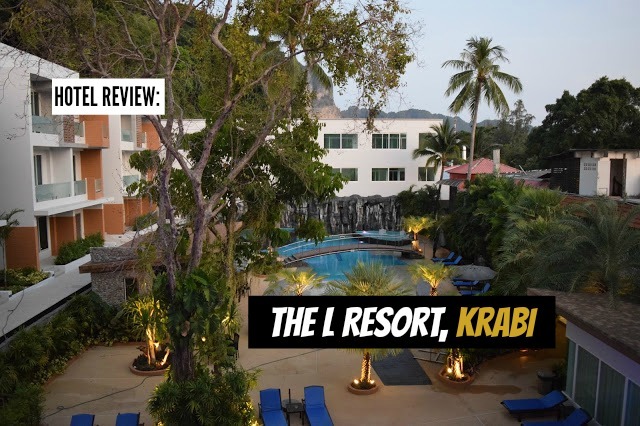 You've found The L Resort, Krabi. Newly renovated, this place has all the peace, comforts and ease of European living, but is still right in the middle of Ao Nang, with easy access to shops, restaurants and bars. We were an hour or so early for our check in, and were pleasantly surprised to be able to wait in an awesome waiting room, complete with comfy sofas, tv and air con! This is such an ingenious idea! There was even a shower in there. Our room was spacious and comfortable with a giant bed. The shower was massive too and there was complimentary water, tea and coffee. Our room also had a pool view balcony! Each room at the the L Resort comes with its own iPad. These can be used to check email, surf the web and use the L Resort's very own app. You can arrange wake up calls, tours, and even book dinner on here. The iPads won't work outside the resort, and have to be returned at the end of your stay, of course, but it's such a great idea and we loved it. If you can drag yourself away from the iPads for long enough, take the time to explore the L Resorts pools and jacuzzi. The two pools are massive! For sunbathing they don't just have sunbeds next to the pool, but in the pools too! The jacuzzi is also great (and also massive). It's perfect for chilling out in with a couple of beers and some friends. Or just take the chance to pose for some photos in it! Speaking of posing, there is also an outdoor shower which is perfect for your Instagram shots! Ao Nang Beach is literally a stone's throw from the L Resort. It was so nice to have a beach day and not have to worry about conserving enough energy to get back to our hotel! Plus, if you forget anything (towels, suncream, beer) it's no effort to go back and get it! Our absolute favourite thing about the L Resort though, was the breakfast. Breakfast is our favourite meal of the day, so you know if a hotel has iPads, multiple pools and is right next to the beach and we're still saying breakfast was our favourite thing, then the breakfast must be epic. And it really was. The selection was extensive: breads, cupcakes, croissants, jams, honeys, eggs (cooked to your specification), Thai breakfast, cereals, muesli, coffee, milo(! ), juice, fruit, yoghurt. But, best of all were the cheeses and the smoked salmon! We haven't even seen cheese since we left Italy, and theses cheeses were amazing. This was hands down our favourite breakfast in Thailand, so even if you don't get a chance to actually stay at the L Resort, just pop by for breakfast one morning! You won't be disappointed. All in all, we really enjoyed our stay at the L Resort. It was comfortable and had lots of niceties: pools, beaches, balcony. But add iPads and the best breakfast ever to that mix and you have yourself an excellent hotel! To make your own booking, head on over to the L Resort's Agoda page or their own website. Make sure to catch them on Facebook and Twitter too. And to keep up with our own adventures, make sure to follow Travelling Weasels on Instagram, Facebook and Twitter. We've also recently started vlogging every day! Our YouTube name is Travelling Weasels (surprise)! and we even vlogged whilst we were at the L Resort, check out day 22 and day 23 to see more of the L Resort, including our own room! Disclaimer: Travelling Weasels were invited as guests of the L Resort, however all opinions are our own.